What’s New in Ceramic Tile Creation and Trends? Good products become better products through evolution. What we’re seeing right now and what’s new in ceramic tile has us eagerly awaiting the future. In some cases, that future is already here. First and foremost, the ceramic tile industry is focusing heavily on creating entirely natural products made from clay, feldspar, sand, and kaolin. This makes them environmentally friendly and also helps foster a healthier environment within your home. As can be expected, technology is playing a significant role in both quality control and the styles and patterns that can be created. This includes the use of HD inkjet technology that allows for the creation of highly customized tile designs. Finally, one of the most exciting developments is the breaking away from the traditional square and rectangular designs of the past. 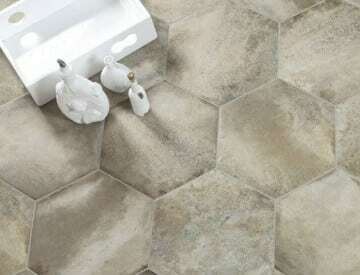 Hexagons and octagons are shaping up to be the most popular tiles available. We’re excited about these developments and expect our customers to increasingly request both specialized tiles and designs for their homes. Wondering what’s new in ceramic tiles? We always have our eyes open for the latest trends and the hottest products, and we invite you to contact us to discover what we see coming over the horizon.